Base class for all RTT Estimators. Definition at line 61 of file ndn-rtt-estimator.hpp. Definition at line 126 of file ndn-rtt-estimator.cpp. Definition at line 143 of file ndn-rtt-estimator.cpp. Definition at line 158 of file ndn-rtt-estimator.cpp. Definition at line 47 of file ndn-rtt-estimator.cpp. References GetMaxRto(), GetMinRto(), SetMaxRto(), and SetMinRto(). Definition at line 164 of file ndn-rtt-estimator.cpp. Definition at line 170 of file ndn-rtt-estimator.cpp. Definition at line 194 of file ndn-rtt-estimator.cpp. 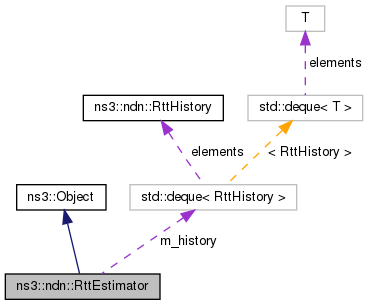 References ns3::ndn::RttHistory::count, m_history, Measurement(), ResetMultiplier(), ns3::ndn::RttHistory::retx, ns3::ndn::RttHistory::seq, and ns3::ndn::RttHistory::time. Definition at line 220 of file ndn-rtt-estimator.cpp. Increase the estimation multiplier up to MaxMultiplier. Definition at line 229 of file ndn-rtt-estimator.cpp. Resets the estimation multiplier to 1. Definition at line 237 of file ndn-rtt-estimator.cpp. Referenced by ns3::ndn::RttMeanDeviation::AckSeq(), AckSeq(), and Reset(). Definition at line 244 of file ndn-rtt-estimator.cpp. References m_currentEstimatedRtt, m_history, m_nSamples, and ResetMultiplier(). minRto The minimum RTO returned by the estimator. Definition at line 70 of file ndn-rtt-estimator.cpp. The minimum RTO returned by the estimator. Definition at line 76 of file ndn-rtt-estimator.cpp. minRto The maximum RTO returned by the estimator. Definition at line 82 of file ndn-rtt-estimator.cpp. The maximum RTO returned by the estimator. Definition at line 88 of file ndn-rtt-estimator.cpp. Sets the current RTT estimate (forcefully). estimate The current RTT estimate. Definition at line 94 of file ndn-rtt-estimator.cpp. gets the current RTT estimate. 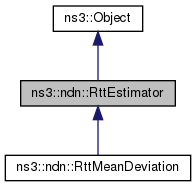 Definition at line 100 of file ndn-rtt-estimator.cpp. Definition at line 179 of file ndn-rtt-estimator.hpp. Referenced by GetCurrentEstimate(), ns3::ndn::RttMeanDeviation::Measurement(), Reset(), ns3::ndn::RttMeanDeviation::RetransmitTimeout(), RttEstimator(), and SetCurrentEstimate(). Definition at line 180 of file ndn-rtt-estimator.hpp. Referenced by GetMinRto(), ns3::ndn::RttMeanDeviation::RetransmitTimeout(), and SetMinRto(). Definition at line 181 of file ndn-rtt-estimator.hpp. Referenced by GetMaxRto(), ns3::ndn::RttMeanDeviation::RetransmitTimeout(), and SetMaxRto(). Definition at line 182 of file ndn-rtt-estimator.hpp. Referenced by ns3::ndn::RttMeanDeviation::Measurement(), and Reset(). Definition at line 183 of file ndn-rtt-estimator.hpp. Referenced by IncreaseMultiplier(), ResetMultiplier(), and ns3::ndn::RttMeanDeviation::RetransmitTimeout(). Definition at line 184 of file ndn-rtt-estimator.hpp. Referenced by ns3::ndn::RttMeanDeviation::AckSeq(), AckSeq(), ClearSent(), Reset(), ns3::ndn::RttMeanDeviation::SentSeq(), and SentSeq().